New York: Heritage Press, 1946. Hardcover. Orig. full black morocco, gilt lettered spine, batik styled endpapers. Teg. Near fine in fine matching batik slipcase. 19 pages in text. 32 x 23 cm, Seventy-four full page color plates printed recto only. 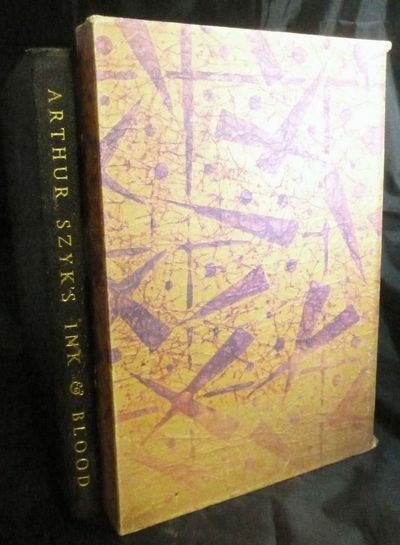 Limited edition, one of 1000 copies signed by Arthur Szyk -- this copy inscribed to Joseph P. Fraczkowski. Szyk's title is a take on "Blood and Iron" a leading German slogan created by Hegel. Szyk's antidote to the aforementioned in his World War II caricatures [as Burt notes], "Words and pictures are bullets whose flight never ends." With Heritage Club Sandglass announcement of the publication. Interior contents clean, fresh and bright.